… and other things the Gov’t doesn’t want you to know. Clearly, the sun has been rising and setting to the north of DFW which is the most prevalent on the summer solstice June 21st but you can still see it at least a month before and after that date. Having a home which faces directly north and is perfectly aligned east and west… the sun never, ever shined in the windows on the north side until just a few years ago. Even the neighbors noticed it from their own homes. For those who don’t know, the sun is supposed to be directly over the Tropic of Cancer on the Summer Solstice June 21st. That is its farthest north position of the sun directly overhead. The Tropic of Cancer is near central Mexico. The sun has NEVER been any farther north until now. (Although there are reports of 11 instances of the Earth tipping over onto its side). We should never see the sun rising and setting to the north of the Texas north border… but it is. All the arguing in the world cannot obscure the fact that ANYONE can clearly see by looking out their window at sunset or sunrise between May and July. Most notable on June 21st. Let the pitbulls and gov’t paid jackals rant all they want to cover it up or explain it away. JUST LOOK OUT YOUR WINDOW. If you live north of Mexico, then the sun should not be rising or setting to the north. It should never be farther north than the Tropic of cancer which runs through mid Mexico. Many of us have also noticed that it stays lighter a lot longer than it used to. This is most noticeable on July 4th when we await the fireworks. It used to be dark enough to see them by 9:30 PM. Now, it is still light until after 10 PM. It really doesn’t get dark until 10:15 PM on a clear, cloudless 4th of July. A couple people have made comments about the darkness and light levels in Canada. Well, I have friends in Nova Scotia and Alaska. Both of them, who do not know each other, have told me about the changes in their light levels in the summer and darkness in the winter. So anyone who says Canada is unaffected is either purposely telling untruths or so out of touch with reality that they refuse or are incapable of understanding the situation. We have also heard from people in the UK who tell us the same. I’ve been there myself. The change in the sun is most noticeable by those of us who are old enough to remember how it was prior to 2000 and the decades before. If you are under 35, it is unlikely you have been around long enough to realize the difference. Be aware of that before taking advice on this issue from someone who has not been around long enough to have seen the changes. NASA and the Gov’t tried to claim all the sat imagery and GPS satellites were damaged that day when this occurred. They tried to remove all images and data for that date. But this site found and collected data from SOHO showing there was no “Historic Flare” at that time. The reason the GPS satellites stopped working correctly was because the earth shifted but the satellites did not. They waited 5 months for an international meeting of scientists before they even announced the GPS failure or “Historic Flare story” to cover up the shift. A software patch corrected the variance in the GPS coordinates in their new positions so they would provide the same readings as before. The flare story was to cover up the cause and all the data NASA and SOHO tried to delete. Can you even imagine NASA being quiet about a supposed Historic Flare for 5 months? They would have been bragging the next day. The reason they waited until April was because they needed to get all the scientists in the same room on the same page before releasing the story. The gov’t and NASA didn’t want any scientists contradicting their stories. So, the info about the flare and GPS was made public the week after the international scientists met. All of the substantiating data is on that website which was able to find some records and imagery which NASA and SOHO missed… as well as the weather satellite imagery which was a great find. The Space weather and SOHO solar emissions records show the solar emissions were far worse during the next 6 weeks after their supposed phony flare than on the date they claimed. The data proves it was all a huge lie and proves the international science community was willing to remain silent. They probably told them the public would panic and they all knew their jobs would be on the line if they said a word. I really get tired of that 1939 War of the Worlds radio play excuse about the public panicking. What they failed to mention was the fact that the radio play was portraying a news report giving minute by minute descriptions and street locations of a deadly attack in progress with people being murdered. They were describing REAL locations and reporting the deaths and destruction of nearby communities. They heard news reports and sounds of attacks and screaming. They did not have TV. Only radio which was pretending to be on the scene covering actual devastation. People had a valid reason to panic. It would be like CNN showing bomb attacks on US cities and reporting it as factual. People did not panic over some silly radio play. They were terrorized by false news reports on their radio networks claiming to be actual attacks. Anyone would be upset over false news reports from their news network. They made the listeners believe their cities were being attacked and the citizens were being murdered and slaughtered by aliens. So using that excuse that people would panic if the news reported a UFO landing in front of the Washington monument is pure hokum. People only reacted to reports of attacks. That is quite different from telling us the Roswell crash was real. The only thing people are upset about is the lying. I’m just tired of them using that radio play as the excuse that the public would panic. As for the shift of Earth… this was just one of many shifts. Each time there is a Tsunami, there is a shift of the earth. It didn’t shift all at once. The worse the Tsunami, the worse the shift. However, it was in 2006 that we began noticing the sun shining in the north windows and setting to the north. It was only then that we began to notice something was wrong with the position of the sun. For people who claim they didn’t FEEL the shift… you also DON’T FEEL the rotation of the earth which turns over 1000 MPH. Do the math for the exact speed. The earth is just over 25,000 miles in circumference at the equator. The earth does a complete rotation every 24 hours… which is over 1000 miles per hour. So why do you think you would FEEL a shift in position if you can’t feel the rotation? The earth is in space… not a bowling ball. The physics in zero gravity space are quite different on inertia in space than inside the gravitational field on earth. It also orbits the sun every 365 days. You don’t FEEL that either. Just because you don’t experience Sci-fi movie special effects you anticipate, does not mean it did not happen. Here is something else to think about. Why some earthquakes produce Tsunami’s and other earthquakes of similar intensity at the very same location or other locations in the ocean, do not produce Tsunami’s. The only time a Tsunami occurs is when the Earth shifts. The earthquake in that particular case is a RESULT of the shift… NOT the CAUSE. It is like walking across the room carrying a bowl of water in your hands. The more you jostle the bowl, the more the water spills out. This is how a Tsunami occurs. When the earth or a tectonic plate shifts, it jostles the water and causes a Tsunami and an earthquake. There are plenty of earthquakes which did not cause a Tsunami. But you can read news reports about shifts measured whenever there is a Tsunami. Remember the big Tsunami which killed over 200,000 victims in SE Asia? That was a huge shift. Not all shifts cause Tsunami’s. It depends on the severity. It is like the analogy of walking with the bowl of water. The slower and more carefully you walk, the less water is slopped over the sides of the bowl. The faster or more roughly you handle or walk… the more water is spilled. That also applies to shifts of the earth. You can learn this by looking at the record of earthquakes in Japan which I believe occurred during March 2011. The first big quake produced the huge Tsunami. However, they had hundreds of aftershocks… several which were more than 8.0 and 8.5 in the very same epicenter which did not produce Tsunami’s. They even sounded the Tsunami alarms for the public on those instances but no Tsunami’s occurred. That’s because the earth did not shift during those aftershocks. Only the earth shifting causes Tsunami’s. Not Earthquakes. The earthquake was the product of the shift and the subsequent instability of the fault line. There is a lot of evidence of the global shifts including increased quakes, increased volcanic activity, Tsunami’s, drastic changes in weather and the severity of weather, temperatures, humidity and changes in the behaviors and locations of tornadoes. The website above has collected a lot of these records to show the information to the public and provides the official, gov’t link sources where the information was obtained to provide proof of validity of the info so you can go directly to the official gov’t site and see it for yourself. It also shows how the shift is affecting our entire planet while the officials are trying to keep it quiet and attack anyone who tries to provide the info to the public. The info may be out there, but few understand how it ties together with the changes we are seeing. Look out your own windows. They can’t hide the sun from you. No lie can cover that up or explain it. Nothing they say can change the fact that the sun is setting to the north… all of the earthquake, volcanic and weather records substantiate the changes as well. You can obtain the data and links to the official sources of that data at http://divulgence.net/. Never let anyone try to convince you otherwise from what you can see with your own eyes. Remember, every scientist and astronomer and physicist either works for the Gov’t or works for a company that receives their income from DOD or other gov’t projects or works for a university or institution which receives grant monies from the government… or depends on them for their retirement. There are not many scientists who are completely independent no matter what country they reside. Most countries are in debt to the US for loans so they won’t defy us either. These scientists don’t dare defy the hand that feeds them. In order to keep their jobs, income and status, they will gang together and destroy anyone who the gov’t targets… lest they end up with no job or no income or worse. Some are quite enthusiastic in destroying the whistleblower… either for notoriety, money or status. There are a few scientists who tried to defy the powers that be. They were either ridiculed or left unable to obtain work in the field of sciences again. Anytime you see a scientist being attacked by other scientists or ridiculed, etc… you had better listen to what they had to say because someone went to a lot of trouble to shut them up. Just ask Bob Lazar… or the scientist who they tried to hang the anthrx mailings on at the Army Lab in Ft Deitrick because he knew who was in the lab since he was the Director and had access to the security logs of which cards entered the labs and knew it was a dirty political action to scare the public into war. They tried to make him a scape goat. Even when he left and obtained a job at Rice university, he was dismissed after just 2 or 3 weeks from pressure by the gov’t. No University will allow their grant monies to be endangered. There was also a woman archaeologist about 50 years ago who found these buried gigantic carvings in central America (giant stones similar to Easter island) which predated human civilization. I can’t be sure but I think the giant carved stones were from 200,000 years ago. Like I said, I would have to do some searching to provide the correct age and location of the stones and her name. She was totally cut off from the university she worked for and was never able to regain a job in her field after she publicly revealed her amazing findings which conflicted with the “Official” story about civilizations and structures which predate humans. I saw the documentary but don’t remember her name or which country except it was between Mexico and Panama. Don’t be a follower of the pitbulls and gov’t jackals sent out to attack like a pack of mad dogs. Think for yourself. Look up the information from official and reliable sources. For the shifting of the earth, you can obtain the info from USGS, NASA, Smithsonian, NOAA, NWS, SOHO, FEMA, etc. http://divulgence.net/ Did you know that lightning data is classified? I didn’t until I tried to obtain some images of 2 ion storms I saw in 2006 (I think). I was told by NOAA, NWS and a University that all lightning images and lightning data were classified. WHY? That makes no sense whatsoever unless they are afraid of off world vehicles appearing in the imagery. I cannot think of any reason for this… and this should concern us. We need to find out why lightning is classified? When researching various controversial subjects, read news sources which are NOT in the US or Australia or UK where Murdock and US or UK Gov’t uses media license pressures to control the news content. Obtain your info from news sources outside of their prevue and the G20 when researching anything of a questionable nature that they don’t want to become public. I know what they do. I was an executive at a telcom company when the Gov’t threatened to revoke our license to provide telcom service to the public if we did not allow them to install eavesdropping equipment on the telcom system before we provided any telcom service. Interestingly, the eavesdropping equipment they forced us to install came from a company in Canada named Walker something. The US gov’t has been eavesdropping on every phone and cell since at least the 70’s. This isn’t something new. There is a set of gov’t rules for any product called NEBS. National Equipment Building Standards. The NEBS have classified sections describing the eavesdropping circuitry in any phone system which they force the manufacturers to comply with. You can’t see the circuitry. It is part of the integrated circuitry and circuit packs and the info is highly protected. Even if you buy an American made phone system and install it in a foreign country, it gives our gov’t access to their phone traffic. Those nice phone lines or ATM circuits, etc., in the misc bay and modem or other access to the OMP which they say are for manufacturer tech support… are also accessed by our gov’t. They have backdoor passwords which bypass any security system including secure ID. This has been ongoing for decades. They don’t want anyone to know about this either. We tried to fight them and they blackmailed us with our license and our business. They do the same with radio and TV stations and networks. I’ve known station managers who were threatened with their station license because the gov’t didn’t like the news they were broadcasting. The major news networks and publishers were all similarly threatened with being cut off from access to gov’t news releases and journalist pools in 2001 and 2002. I highly recommend you stop listening to anyone who attacks other people. If someone is being attacked or ridiculed or targeted… especially after they have revealed information to the public about nefarious things like eavesdropping, or FDA whistleblowers about tainted beef or even poor Lazar who tried to tell us what was going on in Nevada of which those classified areas were under the control of Naval Intelligence, not the USAF even though it was USAF land. This is why the USAF doesn’t have records for S-4 and A51 FOIA requests. They don’t have it. The Navy does. When you see these people under attack… that should tell you their info is extremely sensitive and the gov’t wants to shut them up. That should also show you who the gov’t paid pitbulls are. They are the ones attacking the whistleblowers. I think it is incredibly sad that the public tends to jump on the bandwagon with the pitbulls in attacking and destroying the whistleblowers. Anyone who uses the term “Conspiracy Theorist” is NO FRIEND to anyone. They have been programmed by the media to attack their own. Now the gov’t can let the public attack anyone who tries to reveal the truth. When you allow this to happen, it will hurt everyone because people will stop putting their necks on the line to tell the public what is going on behind the scenes if their only reward is to be attacked by the public they are trying to help. This is what the Gov’t wants. To shut them up. Don’t be a puppet. Learn to recognize who the bad guys really are and the victims of those attacks had something very important to tell us… which is why the attacks are so savage. They dig up every piece of dirt they can find to discredit them. They could do that to anyone. Don’t be one of the pitbulls. Don’t join the pack of mad dogs attacking a whistleblower. Listen to the whistleblower and thank them for putting themselves on the line for your benefit… because they cared enough about the truth to take the chance to tell what they know. Read my post on survival about FEMA, the Red Cross and the Emergency Management agencies. Did you think Katrina was just incompetence? It wasn’t. I was on one of those major metro agencies. There are no plans to help anyone or supplies… they only plan to control & keep the victims corralled, isolated without supplies and held under guard. FEMA runs all of these agencies and when they arrive, they have total authority even over the state government and national guard and media, communications, etc. In a national emergency, they are second only to the President. They even control the Congress. Read the Executive Orders. Fema and the Red Cross have total control. The RC is not what they appear. Fema never revealed their reasons but there is only one reason I can think of for holding thousands of victims in arenas under armed guard without food, water, medicine or basic needs… preventing them from leaving or contacting anyone… They were clearly letting people die. That’s what they did during Katrina. Read some of the stories about St Bernard Parish. Read some old newspaper articles published during that event about the people held in the arena and the reports from Doctors at the airport and the hospitals. I believe it because I have seen a red star in the northern horizon that was not there before and it is not visible in the winter. Not nice, DCS. I can’t post that comment. Bob was sending his comments to me & I approved a couple of them before Bob asked me to keep his comments offline. Which I have. He had no desire to express his ideas upon the group. He only wanted to know what I thought. I’m not into numerology but my ex & mother were. Unfortunately, I do not give out my private info so it was difficult to communicate one sided. I was only able to reply through the comments. I have another site for things like this where he can share his ideas in a different setting. But it was Bob who asked me not to post his views. He was only trying to contact me directly. So it is not true he was trying to press his views on others. In fact, he went out of his way to request I did not post his comments. I may have accidentally approved them while dealing with other comments or replies. But just because the numerology of things like 2012 or Y2K may not have any foundation to them, there are millions just in the US alone which believe in these things. I won’t encourage those ideas. Nor do I condone panic which is a waste of energy when we cannot control the situation. But they are welcome to express them in the appropriate setting on other site pages where they can share like interests with others unaccosted. There is nothing wrong with being prepared for emergencies. The rest of this is just generalizing about other subjects & not direct at anyone in particular. I have other sites where they can express alternate ideas in an appropriate setting without being accosted for their opinions. I may not believe in numerology but there are other things I personally know to be true which 99.99% of the population would never believe because they have been programmed with knee jerk reactions to conspiracy theory labels like pavlov’s dogs. They would not believe if a UFO landed in their front yard & knocked on the door. Our egos are so huge we actually believe we are the only intelligent life in the Universe and ancient primitive humans laser drilled & precision cut puma Punku without power tools or electricity in the thin oxygen at 13,000 ft. above the tree line, food or water. Those who do believe seem to think they are here to help & guide us. Listen to Col Corso They are not here to be friends, run like hell if you see one. We were only laborers due to them intolerance for heavy gravity & high oxygen levels. We mean nothing. They only come for water & food for their moon mining settlement. Our gov’t has no control. Read his book. Philip Corso was over the NSA under Eisenhower at the Whitehouse for 4 years. He handled reverse engineering through Darpa & the Pentagon. He was a consultant to the only 2 senator’s cleared to oversee the black projects budgets. This man was at the top of gov’t black projects. One of the most highly classified gov’t who ever came forward while a double agent gov’t hireling Stanton attacked Corso & Lazar to discredit them & ridicule so the public would turn on them. Anytime someone of their backgrounds comes under such vicious assault is when the gov’t is desperate to destroy their credibility. So Stanton sold out the UFO buffs in exchange for the truth & Shermer never had any scruples. The public had their chance & blew it. Corso didn’t live long. Now nobody will come forward. The public doesn’t deserve their sacrifice or to know the truth. The public has repeatedly attacked highly respectable whistleblowers who tried to tell the truth by joining in with the gov’t hirelings who wanted to destroy their credibility so they wouldn’t be believed. People say they want to know the truth then attack someone who comes forward to tell them. Corso, Lazar, Schneider, Colby, Marcel, adm Forestall, Patton, Wellstone, Carnahan. A long list of people. Most died shortly after they came forward. One was brutally defamed. There is so much the people would know if they would stand by the whistleblowers & listen to what they are saying. Protect them from attacks. They even tried to accuse Patton of insanity for fear of what he planned to tell the public about Eisenhower. Ike gave our allied POW’s to the soviets in Siberia & reported them as dead. Then cut off Pattons fuel & ammo when he was 5 miles away so the Soviets could get there first. Then Ike gave Stalin 2/3rds of Europe. Patton made the mistake of telling Bedell Smith he planned to go home on the 10th, resign so he could freely tell the public everything & planned to stop Ike from becoming president. His accident was on the 9th. Ike filled the newspapers with his campaign on the 10th as if he knew there would be no protest. I have a copy of Gen Patton’s actual hospital medical records after his accident & his own journals. There had been 3 prior attempts on his life just within the last 6 months in 1945. Including another car accident 2 months earlier. He was regaining the use of his limbs. You can also read this in the newspaper official medical reports. So when they planned to send him home they tried to cause his lungs to fill with mucous with casts & drugs. When that didn’t work, they gave him digitoxin & Mercuperia on the last day of his life with no medical need. He had no heart or BP abnormalities until after the Mercuperia & a second dose of digitalis. It was the Army Chief of Surgery who arrived with the Mercuperia & ordered by the doctor Ike sent. Mercuperia is a radioactive Mercury which causes digitoxin to double its effects toxically which cause erratic heart behavior and death in all of 9 patients who received it 6 months earlier. I have a gov’t document which describes how every use of Mercuperia with digitalis was fatal. It was only experimental since 10 years earlier & too dangerous to use & had no value. It also stated it was an IM drug only. They put it in his IV. It’s only use was a tracer a decade earlier but the mercury remained in the bones & organ’s making it unusable. The gov’t had to go to extreme trouble to get this drug flown to Germany from Los Alamos. Only Eisenhower had the authority. The doctor treating Patton was a teaching admin without a private practice whom Ike called in special to treat Patton whose ministrations killed him just about 3 hours after the Mercuperia. Patton was doing great until Spurling took over & he certainly did not have a background in cardiologist to order unnecessary drugs. But he was rewarded with an appt to water Reed as Chief of Neurology by Ike about 3 days before Pattons died. The problem is no one has since bothered to find out what they had done. Or understand these drugs. No one knows what Mercuperia was since it was only used on a couple dozen patients ever. And was not something from the hospital pharmacy. They wanted it to look like a cardiac failure & figured no one knew what the drug was or what it would do. Only decades later were the documents on this drug accessible. No one has ever heard of it. They never thought anyone would compare the drug on Pattons hospital chart. It gets a lot worse. Oddly, as Patton was left alone to die, not one doctor was summoned to see him despite the change in his vitals. They gave him more drugs to knock him out & he drown being unable to cough mucus due to a cast they had placed around his chest 2 days earlier. Nor did they try to suction or use mucous reducing medicines. He did not have an aneurism in his lung or any symptom of one. He was definitely sleeping soundly & drowning & digitalis toxicity slowly killed him while they kept his wife out of his room. Patton had said he would die that day. He knew. If you had read his miraculous recovery during the first 10 days where he was even sitting up & eating, you could see what they did to get rid of him on those last 2 days. There was zero reason to give him either Mercuperia or digitalis. He had zero heart problems perfect blood pressure & perfect temperature until those drugs were given on his last day. People should have supported & protected these whistleblowers. Including Patton, 3 generals died in Dec 45. Another, 6 mos later. All his friends. Pattons niece mistress died 2 weeks later. Bedell smith was always handy for every death. Especially after he was head of the CIA. Pattons daughter in 52. His wife brain hemorrhage in 53. The driver of the second vehicle of the hunting trip died from a bizarre brain hemorrhage in 52. I could write books on Patton’s last 9 months. The problem is the truth of many things is so unbelievable that people cannot believe it even when someone irrefutable comes forward & dies in the attempt. The public jumps on the bandwagon of the gov’t hirelings, jackals & pit bulls & attack these whistleblowers like a pack of dogs. The people don’t deserve to know the truth. A thankless lot who bite the hands that fed them. There are people who still don’t believe the terrible things the CIA has done with human experimentation even though the CIA Director William Colby testified to congress & released the documents & tapes to public access & was fired for it by President Ford. & later killed for fear he planned to reveal more. These were quite horrible experiments. There are people who don’t believe George Washington was a Freemason even though he was listed on their records & posed for a painting in his mason’s apron made for him by Lafayette’s wife. He also performed the Masonic rituals in Dedicating Washington DC. Even the bible he swore his oath of office & many of the constitutional tenants were also masonic As were more than half the Continental Congress Patriots including Ben Franklin. There is a photo of Prince Philip (QE2’s husband) presiding over hundreds of freemasons. But if you mention it, people roll their eyes & scoff. Anyone who says such a thing must be a conspiracy theorist. Clearly, they never opened a book & watch the gov’t version of history on TV. They are uneducated except for revisionist histories like the cherry tree fable. There is so much truth that people don’t know or believe which is in the founders own handwriting in letters & journals. So the majority don’t know what’s true despite documented proof. People are their own worst enemies. One day they will wakeup after some disaster & find themselves looking at Martial Law. Then they will discover what some of us were trying to explain. It was reality for those in Katrina. But that was only the tip of the iceberg. Read about St Bernard’s Parish during that disaster & you might get some insight on what may be yet to come. Hopefully, not in my lifetime. But everyone has become so jaded & programmed from paid documentary revisionist history that they don’t believe the truth despite absolute proof. May I suggest audio books. However, those subjects are for other sites. I just try to provide measurements on the position of the sun how which everyone can look outside & compare & makeup their own minds. Quite possible. I would have to see the weather patterns & temperatures for that decade. I remember there was more snow than in the 70’s thru Y2K, but not as much as we would expect from a significant axis shift like we saw last winter in the northern & NE states. But since the axis angle receded this past summer, our winter this year should not be as severe. Today, for example, began at 42 degrees. 48 at midday. It was 52 at sunset and currently 60 degrees. It is getting warmer during the night than it was during the day. I have not seen nighttime warming like this before. A curious temperature pattern. Nights are usually cooler. Not warmer. The winters and summers of the 1700’s were so extreme that I believe there was a similar axis shift situation which occurred during that century… if not worse than what we see now. Perhaps there is a periodic planetary wobble every 50 years causing these extreme weather changes such as we saw last Winter due to the extreme tilt position which our planet had shifted. But nothing we had seen until the ravages of last Winter has yet compared with the severe weather of the 1700’s when the winters were so cold the rivers froze solid overnight & the birds fell to their deaths from the trees. Blinding blizzards endured nonstop for over a month when the horses were up to their knees in snow. These were the same winters of the 1770’s were when the Revolutionary troops froze at Valley Forge and Monmouth, NJ. The 1740’s were when the Irish died by the hundreds of thousands in a famine and worst winter of record. The Summers of the 1770’s hit record highs in Pennsylvania above 120 degrees. Higher temperatures than we have seen since; outside of a desert. British soldiers were dropping dead by the dozens in the midst of a battle with our soldiers due to the extreme heat. More died from sunstroke than battle. The British were accustomed to a cooler climate & were wearing wool uniforms & rapidly dehydrated to the ravages of Sun stroke. Just 15 minutes in 120 degree weather without constant rehydration was a death sentence. Conversely, Winter temperatures cold enough to freeze a river overnight were deadly to the troops without clothes, shoes, food or blankets. 2500 died in one winter at Monmouth. Our weather will reach those records if our axis continues to shift. It is only recently that I saw similar patterns in the 1700’s & other segments of our past history. Egypt is a good example of how the polar ice melted, significantly raising our sea levels & flooded the deserts of Egypt which covered the sphinx beneath the sands & Cleopatra’s palace beneath the water. We also see lost coastlines from axis shifts of the past. One scientist on a 2008 documentary described how our planet has shifted 11 times in the past onto its side. However, these extreme record breaking weather patterns such as the 1700’s indicate we are also dealing with a wobble as well. That scientist who was on a TV series like Planet Earth also stated we were due for another slip onto our side. I cannot remember his name but I find the correlation of all these past historic weather patterns & loss of coastlines to be connected to what we are seeing now. The question is whether this is a wobble or a full tilt shifting our planet onto its side. The next couple years should answer that question as we measure the position of the sun. When it comes to numerology, they said the same thing about June 2006 as you described about June 2016. In fact, I think they make those same predictions every 10 years which end with 6 if my memory is correct. I remember the same in 1986 (especially with Haley’s comet) and in 1996 as well. Then there was Y2K. As a scientist & engineer, I prefer solid evidence such as the sun’s position on the horizon which everyone can see. I was lucky. I lived overseas for the latter half of the 60’s & was not subjected to the awful bigotry & violent riots of that decade. I had no idea that there was such hatred & prejudice until I returned to the US in 71. Definitely a culture shock. So perhaps those bad predictions already occurred & are behind us. I created & renamed a couple other sites for these other subjects where anyone can post other subjects of interest. Thanks for the writing. I always felt that 3 mile island and others were hiding the truth by consistently claiming that nuclear is safe when it’s exactly the opposite. It’s not safe! The TRUE reason behind those claims may be revealed soon when a couple of reactors get “damaged” due to whatever cause and we get the Fukushima type of solution. All nuclear power plants may be shut down…!!! I am trully worried by this, it will not end well. The KEYSTONE PIPELINE project just got burried a couple of days ago. Next, after the 29/11/2015, will be the nuclear power plants. They MUST close those before the 6/6/16 event! As a matter of fact, the main motive behind the Shock #1 is the closure of most, if not all, nuclear power plants. The controllers know that next year’s events will destroy many of them and the cooling will be impossible under chaotic circumstances. Massive power reduction over a period of only a few months in the early 2016, means massive social dislocation and catastrophic number of casualties. Those whose lives depend on reliable power supply will be the first to go; ironically it will be a blessing. Hopefully, you are prepared for this. There are 3 power grids in the US. One covers the eastern US. The second is for the Western US and the third is for Texas. As for the Nuclear plants… unfortunately, just the opposite has occurred. A few years ago, the gov’t has provided billions of dollars in subsidies to build dozens of new nuke plants. This is a bad deal. The monies will mostly go into the pockets of those building the plants which means they will cut corners on safety, on welds, on concrete, etc. There is not any safe storage of spent nuclear fuel rods for any of the plants so they have been keeping them in pools inside the containment buildings at each plant. These rods are so hot that they glow blue. Blue is the color you see when something becomes hotter than “white hot”. These are open pools containing the spent fuel rods. As I was growing up, the propaganda on friendly nuclear fuel was so great that I decided I wanted to become a nuclear physicist and was quite determined about that since the age of 5. But this terrified my father who was in military intelligence because his brother was killed in a nuclear test incident. Curiously, he is not listed in any nuclear accident… so they still claim no one in the US was killed from a nuclear incident. This is a big lie. I also recommend that everyone read about the victims of 3 mile island on the links below. Hundreds of people died within 10 years of that incident. There are some documentaries as well on several incidents. The gov’t and nuke industry does not want this information known because they fear the public will shut them down again as they did in California after Diablo Canyon and 3 mile Island in PA. No nuclear plants were build after that… but I wonder if that also includes private, military and industrial reactors? But some plants use plutonium fuel rods as one of the 4 Fukushima reactors did in Japan. Unlike uranium fuel rods which can be kept in pools of circulating water to keep the spent rods cool for decades, plutonium catches fire when wet. This is why there was a billowing plume of smoke rising into the upper stratosphere while the response teams flooded the 3 reactors with water trying to avoid a meltdown. The burning plutonium looks like fiery snowflakes or sparks similar to what you would see from a bonfire. Plutonium cannot get wet. Nor can it be stored in pools. It has to be encased in special caskets. Plutonium is one of the most dangerous nuclear fuels. Just a microscopic speck of plutonium inhaled will cause cancer. Inside the human body it will create a substance known as Americium (if my memory serves correctly). This is what they found in Karen Silkwood after she was deliberately exposed to plutonium after she exposed corrupt practices and cutting corners and safety and bad quality at the plant where she worked creating nuclear fuel. Her family won the case against Kerr McGee. The billions of dollars in subsidies creates such vicious greed that many whistleblowers in the nuclear industry have been found dead. This is no joke. Karen was only one of several. One of the biggest coverups in the US was 3 mile island. I had friends who lived less than 5 miles from that plant. When visiting their home, you could see the reactor towers from their yard. Within 10 years, the wife had leukemia and the husband had sudden onset alzheimers and died of a bleeding brain hemhorrage. Now you might think their ailments were coincidental until you learn that there were 42 cases of leukemia within 2 blocks of their house. If you read further you would find over 600 cases of leukemia in that area. Thousands of victims took the power company to court. In order for the victims to get any money from the court case, they were ordered to be silent by the judge. Not to discuss or reveal their illnesses or payment to anyone. There is an actual copy of the court finding on the internet as well as an article about 2 experts who worked at 3 mile island during the disaster who had to run for their lives because the power company send hired hit men to go after them. A real life “3 days of the Condor” incident. Since all of the victims are dead now, the power company has been changing the details of the story and watering down the truth of the victims caused by their release of radioactive contaminants. Another case of revisionist history. All of our history is being rewritten. I feel sorry for those younger generations once all of us who remember the truth are gone. There were even incidents where everyone who copied a particular show on DVR discovered that their copy of the show had been deleted. This occurred on multiple cable service providers who all claimed it was an accidental software update glitch. Those of us who used VHS… still have a copy of the program. So, let that be a warning. They can also zap your DVR. Also if you copy Ultraviolet movies… they can zap your computer of any contents they don’t like. I was a consultant on the companies who were developing these products to access your recorders and computer content through your internet or cable/satellite provider. I highly recommend that everyone should start doing a lot of reading and research about their foods, medicines, toxins, etc. Sound like a fiction TV movie? You would be amazed at what goes on IRL. Remember the Russian spy who fled to the UK named Litvenenko? He was contaminated with radioactive polonium by a Russian agent. Litvenenko gave a dying interview from his hospital bed. Things like this really do happen in real life. By the way, they use polonium in Dental materials. I always have my dental products custom made not to include these semi-precious (as they call it) metals. I designate every type of metal to be used. I don’t care how degraded the polonium is, I won’t have polonium in my dental products. Back to the nuclear plants, the worst plants are the ones the public doesn’t know about. Private reactors for universities, medical products, industry, gov’t labs and the military. No one is keeping a watch on those plants nor do you hear about any incidents. Just a few years ago when a major hurricane hit Galveston again, they never told the public about the 3 private reactors on the Texas coast near Louisiana which were also hit by that same hurricane. The problem is the same as Japan. The reactors require power to keep the water circulating to keep the reactors and spent fuel pools cool. Usually, each plant has backup generators when the plant is damaged to keep the circulators running. But like Japan, the same surge of flood waters and hurricane winds damaged those generators. Without power, the reactors go into meltdown. In the case of the Galveston hurricane, they brought in the troops from San Antonio and kept the news reporters occupied elsewhere. They took the reporters on helicopter tours of areas which the military cleared for public consumption. So the reporters never got to see stranded victims or the conditions of those private reactors. All of the news access was carefully choreographed to prevent us from seeing the reality as we did from Katrina or Japan’s Tsunami. While Californian’s were successful in stopping power plants from being built on fault lines… those existing plants, although closed, are still there. They still have to monitor the spent fuel pools and reactors. I have an inlaw who works at one of those “closed” plants. Then there are the Navy and Army nuclear vessels and barges which are docked in Virginia (I think. I will have to check). Possibly NC as well. These vessels are awaiting decommissioning scheduled about 30-40 years after they were docked. Most of these vessels wont be scrapped until 2035 to 2050… and they keep extending the dates. These nuclear reactor vessels are parked near highly populated areas. I also have another relative who was a nuclear tech on an aircraft carrier. Every 10-15 years, these carriers are docked for two years while they cut out the deck and remove the entire reactor, and replace it with a new one. I was shocked when I learned about that. We should wonder what they did with the reactor they cut out. If you want to read about some of the worst contaminated areas, there is one off the Columbia river in WA (upwind from Contra foods farms in an area where farm animals and children were born with horrific mutilations). There is a documentary about this. I think it was called Deadly Deception but I’m not positive. Another in Savannah river flats… GA (I think), Rocky Flats, CO which is on the outskirts of Denver (and these idiots are now building homes in the contaminated zone) and not to forget NM near Los Alamos as well as the Nevada test site. There was another in NJ and one in Idaho. I had a friend who worked on cleanup of contaminated sites. There are a number of documentaries about these places which will give you nightmares. This is a very good example of things the older generation remembers… like Love Canal. But our descendants are not interested in hearing about these things… so they will probably end up living in some nice fancy house totally oblivious to the fact that the area was horribly contaminated 40 years ago. Each state also has a hazardous waste dumping site as well. Radioactive elements are not the only danger. During the Japan meltdowns in 2011, the US nuclear industry was so terrified the nuclear plant subsidies and projects would be shut down that they flooded the media networks with “paid experts” to tell all of us that we were in no jeopardy whatsoever and bad mouthed anyone who said otherwise. So naturally our younger generations jumped on their bandwagon and did not want to hear what the rest of us had to say. I have 2 Geiger counters I used to measure the fallout. Remember what I said about 1 speck of plutonium and how one of the Japan reactors had burning plutonium fuel rods billowing smoke filled with plutonium particles into the air where it travelled eastward. They were measuring high volumes of radioactive fallout in Iceland just 2 days after the fires started. There is also the danger of Strontium which falls onto the grass where dairy cows graze and gets into the bones of anyone drinking milk. It is viable for 90 days. That is 90 days after the fallout stops. The Fukushima plants were billowing radioactive smoke for months. And that was not the only issue. Radioactive water was being dumped into the ocean. News articles stated radioactive Tunas were found just off the coast of San Diego in Aug 2011. I find it bizarre that the news networks are just now talking about nuclear radiation from Japan just reaching the US when it had already done so within 2 days of the incident as fallout in the air mostly in the northern states under the jet stream and in fish just a few months later. I suppose they must be talking about the ocean currents… but it has been here since 2011. But they covered it up on the news with their paid spokespersons. However, if you really want an idea how dangerous it was, just read about the 300+ US navy personnel on the USS Reagan who were unknowingly exposed to radioactive fallout from those same Japan reactors who came down with horrific cases of cancer… and the Navy denied any help for those sailors who lost their court cases. I also know of other soldiers in the Army and other branches of military who were denied compensation or care for the toxic agents they were exposed to as well. The officials will go to any lengths to cover up nuclear or toxic accidents or injuries. I set up another site for your other subjects. It only has two posts so far. The original one was to go with this site. I added a new post where you can share your other subjects. CERN is my greatest concern. That is the culprit for the overcast skies in my opinion. Today is the 5th of October and the skies still look the same. It all started on 24th of September, one day after the Hadron Collider had reached the now in-famous Speed of 14Tev. Here, the weather bureau keeps scaring us by predicting a drought until May of 2016. Supposedly the drought has already started; but you know what… they expect 5 more typhoons until the end of 2015! Now, this is what you call MASTER CONFUSION. I will keep an eye on this haze and if it’s still there by end of the year, then I will be able to say with a high degree of confidence, that it is NOT natural. While I agree the weather has changed, I disagree that Cern is the source. Logic dictates that you would see dense circular cloud formations directly above Cern & spreading outward in circular patterns from the center of Cern. It would not jump to the other side of the planet without affecting the area above Cern. Cern would be at the densest point & center of the disturbance and those residents living in Europe would be quite incensed about any such cloud cover developing over Cern. It would not develop clouds halfway around the planet while leaving the area above Cern clear. The same goes for Haarp. If that affected the weather, the densest concentration would be directly overhead. What we are seeing is a shift of the axis which has altered the flow of the polar currents & warm currents of the oceans as well as the jet streams & other atmospheric patterns which create storms. For example, we’ve seen the jet stream dipping down into Central America where it has never flowed before the shift. The coriolis effect has allowed the formation of a circular “land based” hurricane-like weather pattern in the Center of the US during the Spring months of April & May. Not to mention shifting our position hundreds of miles further south in the summer & further north in the winter. Another example is the shifting of the polar ocean currents on the pacific coast which used to produce rain storms in California during the winter months when warm air interacted with the cold water. With the axis shift, the ocean currents along the Pacific coast have warmed up & reduced the formation of rain storms. Hence the drought. You can track the axis shifts by measuring the sun position each year on the summer solstice June 21st. The axis changes affect weather worldwide. Chemtrails are an additional source of cloud cover but only in areas which are being sprayed. You may notice the TV weather broadcasts no longer show cloud patterns. They now only show areas of precipitation rather than the actual cloud cover. I did notice that NOAA altered the satellite images where the chemtrails were being created. I was watching the planes from the ground as they sprayed the chemtrails & took photos of their progress. But when I wanted to compare the weather satellite cloud development imagery, it had been altered & they eliminated the chemtrail clouds. I was photographing the spreading of clouds while the satellites showed none. On your unposted items, it sounds a lot like the description of Mohenjo-Daro. While all of the sites describing the vitrification & radiation of that era attribute the radiological events to ancient nuclear bombs, I believe it was more likely caused by a crash of an interstellar craft powered by radioactive element 115. Either crashing into the ground or crashing into another craft rather than a weapon or battle. Using nuclear weapons on unharmed primitive cities makes no sense. An accident of interstellar craft would be more likely. Particularly since the skeletons were also radioactive. Your description & timeline sounds like what already happened with Mohenjo Daro & other Ancient radioactive sites. Perhaps those dates & events you quoted are from their BCE era & not in our timeframe. A past event rather than a future event. The events definitely fit the Mohenjo Dara era. So I suspect these dates & events already occurred in the BCE era rather than upcoming dates. A calculation error of a past event denoting Mohenjo Daro timelines rather than our own. Nor is it based on age. Just the similarity of events you quoted fit the Mohenjo Daro era events and timeline. As I stated, I don’t think these events & dates you described on the nonposts are upcoming in the immediate future… I believe the dates & events you described already happened in BCE era. Mohenjo Daro being one of them. I believe the timeline was misinterpreted for our current modern era when it already occurred far in the BCE past. An easy miscalculation between BCE and ACE. I am curious as to the source of these dates? It might shed more lighten whether this was a past event as I suggested. That’s not to say we wont have a calamity coming soon. Our gov’t seems to be preparing for a calamity to occur between 2020 and 2026 but I have no firm intel on the dates. We can also measure the axis changes each year but I cannot predict the specific year of the final shift. I can only show the annual changes. Everyone can verify the info I post each year to check my accuracy & veracity. I am interested in a wide variety of subjects but I make sure I only provide accurate verifiable data on the axis changes which can be confirmed by anyone simply by looking at the sunrise & sunset each year on June 21st. This is one subject which people can obtain honest info & answers they can easily verify. As for these other unrelated issues, I’m interested but there is no way to verify the accuracy. However, that does not make them true or false. So we can still research these other subjects with an open mind until we can determine whether they are factual or not. We can also speculate on these other interesting but unrelated issues. There is also another vitrified glass site in the Egyptian desert. It is round & 8 miles in diameter. There was some Ancient jewelry made from the glass for the pharaoh which was misidentified as peridot until someone recognized it as glass. However, I do not know if it’s radioactive or not. The sand could have melted from being the landing site of an interstellar craft which was hot enough to melt the sand. Then it would not be radioactive. However, I hear vitrification being attributed to nuclear heat but I’ve seen artists working with molten glass quite easily. If a simple artisan at a fair can melt & manipulate glass, why wouldn’t an ancient blacksmith be able to vitrify (melt) sand into glass? When we see ores with higher melting points being vitrified and presenting radioactivity, those are the events we should question as a nuclear vitrification. But we should not assume it was a weapon or deliberate hostile assault. It could simply have been an accident. I try to look at all alternate possibilities. I was amazed at how many one sided viewpoints are on the internet. Not one person considered Mohenjo Daro could have been a crash or accident. Every person & website all assumed it was a war or a nuclear weapon. Single sided thinking, to be sure. This also makes it precarious to accept the assumptions from people or sites with a single sided viewpoint. There is a saying about those who “assume”. At the very least, I hope I can teach people how to consider various open alternative viewpoints. Perhaps this could also reduce hostile interactions if people would place themselves in the shoes of others when they disagree. I’m responding to some interesting comments which are not posted per the senders request for privacy. So my replies may not make complete sense but there are portions which may be of importance to everyone. This reply is to clarify where & when the best survival regions would be safe & the hazards to anticipate. I do not feel that Southeast Asia will be safe from the final Tsunamis when the axis shifts the Earth onto its side. The 2004 Tsunami which killed over a quarter million people when it shifted the axis about 850 miles from its original position showed us a Tsunami which reached from Africa to Southeast Asia & Indonesia. When the final axis shift occurs, Southeast Asia, India, Indonesia, Arabia & Africa will be completely swamped by a giant wall of water which will cover entire continents. Similar to the movie 2012. Only those at very high altitudes will survive. The surging wave will be much higher than the post axis shift levels. Survivors would need to be at least 650-1000 ft elevations for the final tsunami. I believe it will strike every continent but keep in mind that the direction of the waves will be reversed on opposite sides of the planet. So if the Asian side of the planets axis shifts downward again like it did in 2004, creating another northward moving Tsunami wall of water to swamp & cover the entire southern portion of the continents from Africa to Asia 1000 times worse than 2004… then the opposite side of the planet which is centered on the America’s will receive a Tsunami traveling south from the northward planetary shift. However, the time of year and time of day could dramatically alter those motions. The safest places “during” the moment of the final axis shift will be at high elevations away from coastlines. Rockies, Alps, Sierras, Himalayas, Urals, etc. It is only “after” the final axis shift has occurred & left the planet resting on it’s side that the region most survivable will be between our original tropics near the equator. These tropical regions will only be safe AFTER the final shift. If you are there during the final shift, they will be death traps just like the 2004 tsunami. But no continent will be safe during that final shift except at high elevations protected from landslides or mudslides and away from volcanic activity. Such a dramatic axis shift will not be limited to Tsunamis. There will also be extreme shifting of tectonic plates, record level earthquakes, eruptions, landslides, global disturbances which will also cause industrial catastrophes such as our nuclear reactors & chemical plants, etc. Not to mention the debris and toxic contaminants which the tsunamis pull into the oceans after surging inland. I just wanted to be sure that everyone understands the safe region for survival, only applies to the tropic region temperatures & elevations above 300 ft AFTER the axis has fully shifted the planet sideways. You don’t want to be there until after the axis shift. The Earth doesn’t have enough top weight to flip completely upside down which is why it will rest on its side after the final axis shift. Beyond the tropic region, the temperatures would be too extreme to survive with the planet shifted onto its side. I just wanted to be sure everyone was clear what to expect if the planet should completely shift its axis during our lifetime. I endeavored to post 4 online replies to your offline posts but each time my replies crashed & my entire response was lost so I will have to rewrite my replies & resubmit them. I just wanted to explain the delay. I am not ignoring your posts & keeping them offline as requested. My last 4 responses were all lost by WordPress. It is very disconcerting to rewrite everything. Yes, I agree the effort would be wasted on most & those who are interested already know the details. I have other sites for these other subjects of interest which would be better for those discussions. I obtained the photos directly from the original source for authenticity. Many images are directly from the Navy clementine lunar satellite or Nasa’s Mars satellite. I’ve found many things of interest on that subject directly from the original source. No 3rd party imagery. I have more if you are interested but those conversations should be on those sites rather than the axis site. I don’t want anyone to think the axis info & measurements are tied to anything else. I always provide truthful, honest information on any subject which I have personally researched & investigated from reliable original sources. I personally validate anything I post but I keep the subjects compartmentalized. There is no point confusing people by mixing info about the moon & Mars or Ancient aliens with the Earth’s shifting axis. The subjects are not related so there is no point in muddying the water by unnecessarily mixing subjects. Here are a couple items which might interest you. Be sure to read all the posts on the first link and just the first post on the second link. These posts are in response to one of your offline post subjects. I have a couple links for you on those off subject issues you mentioned in your offline messages which you might like to see. Each time I have attempted to post this reply, the system has crashed & deleted my message. Read all the articles on the first link. All of the images and info are from the original source. Official reputable sources such as the US Navy Clementine satellite & Nasa. They have since removed some of the original images because people failed to take my advice about keeping silent about the image coordinates & not contacting the Agencies regarding the photos. People just could not follow directions & did not keep their traps shut so the originals were removed & ruined the opportunity for anyone else. However, knowing how people & govt agencies are… I made copies of ALL their original images. Millions of terabytes worth of image downloads with copies preserved at dozens of locations to ensure they don’t disappear like Patrick Stewart’s “Safe House” film method. Removing the originals accomplished nothing. Removing me will Automatically broadcast all of them. Keep in mind, all Nasa & other world govt images are heavily edited by Nasa before being released to the public. They use heavy contrast, blurring & pixilation to “hide” what they don’t want you to see. The third link below will show you how to undo those edits. It is an Unfinished website. These are just a few of the original images on these links. Plus additional info on subjects you mentioned. Since September 24th 2015, we are constantly having a hazy type of weather. I used to see clearly details 40km away, now it’s barely 3km. I see it because I enjoy a 180 degrees view facing the ocean, it’s the real food for the soul at my age. I am wondering if your skies are clear in your area? Please let me know because this doesn’t look normal. They may be spraying chemtrails near you. They used to spray them directly overhead here for years but with W living here, they shifted the chemtrails over the panhandle before dawn. By the time it reaches us at daylight, it is a hazy misty overcast. Even foggy sometimes and sopping wet. Not typical for dry Texas heat. According to the chemtrail contractors, we are spraying worldwide including Saudi Arabia who can surely pay for their own Costs instead of using US taxpayer dollars. Each plane load costs well over $100,000 per flight just for fuel, chemicals, pilots & ground crews. The cost does not include the plane or upkeep. They usually have 2 jets spraying in a spoke pattern from their fueling point (usually an airbase. Tinker is one such AFB). I’ve even seen chemtrails over Belfast Ireland. Our gov’t is trying to cool off the temperatures to slow down the glacial melting & loss of lakes & rivers & agricultural lands. California’s drought & water crisis is a prime example of allowing rice farms & other produce farmers to completely deplete rivers & lakes due to total lack of oversight and planning. The lack of water source renewal is also due to the axis change shifting them to a warmer climate position & warmer ocean currents. It was the ice cold artic current off of the pacific coast of California which generated the storms for California’s rainy season & snow packs. The warmer currents do not generate the storms off the coast. I’ve seen temperature drops from chemtrails as much as 20-40 degrees within an hour. I don’t agree with the chemicals they are using but it definitely has a cooling effect on the heat directly under the clouds & often provides a much needed cooling rain in dry areas. But the chemicals are toxic to people, animals & environment, the expenses are horrific and the SF6 gas is massively damaging to global atmosphere & climate while the aluminum compounds are toxic. I took some interesting chemtrail photos where I live & put them in my Chemtrail post. However, my hyacinths bloomed this month. Hyacinths are strictly high perfume bulb flowers which only bloom in March or April . They never ever bloom in the fall. My trees, flowers & wildlife are confused. The trees are also turning Autumn colors in May & June. If the planet was upside down, then this would be normal for the Southern hemisphere with reversed seasons. But never for Northern Hemisphere seasons. I believe we are going to have a much milder winter than last year. I accurately predicted last winter would be the coldest historic record breaking Winter when I saw the Sumner Solstice sun position had indicated increased axis tilt several hundred additional miles in 2014 (2000 miles north of the original Tropic of Cancer position). Which meant the sun would also be 2000 miles farther south during our winter. We were indeed hit with the worst record breaking Winter in history. However, this year the sun position reverted and decreased by 1200 miles so we are now where the axis was in 2006. It is still over 850 miles north of the original tropic of cancer in June but much better than the 2000 miles increase we saw in 2014. But we will see a much milder winter upcoming than last year. The meteorologists are always predicting the opposite of what we actually have. If I can see it, they should be able to as well if they would look out the window & use their own eyes & stop accepting gov’t propaganda & altered data for their baselines. I have some photos on my recent posts showing the sun positions measured since 2006. It is easier to see the changing axis marked on the photo. The 2015 reversion was the surprise as was the 2014 sudden increase. The only explanation which makes sense is the death wobble like a spinning top just before it falls over begins to do exaggerated wobbles at the end stage. I wasn’t expecting those results. All we can do is wait & see what it does in 2016 and the subsequent years to see if it holds position or makes more startling changes. Only time will tell. If a global calamity does occur, more of us will die from loss of infrastructure or violent mob uprising & panic than the calamity itself. Food, medicine, water, utilities will be the primary catalysts for violence & death. Those very same naysayers who attack those trying to provide info on what to expect & how to prepare. Not to mention the FEMA Martial Law troops which will corral, control & contain any remaining victims & hold them without food or necessities until they die or lock them into FEMA prisons without trial or simply eliminate (execute) survivors as ordered & remove the evidence in a well hidden mass graves. They are already well prepared. Katrina was no accident of incompetency. Corral, contain & control with troops. I was on the emergency management agency of one of the largest US metro areas. FEMA & red cross run everything. There are no plans to feed or rescue anyone. Read the Presidential executive orders concerning FEMA. They even outrank the VP, cabinet, Congress & Senate. They are only answerable to the President. All I can advise is to get out of the metro area within 45 minutes of a catastrophe. Have a family meeting place & plan prepared. Your cell phones & land line phones will be disabled Only 911 will function & those circuits are limited. Cutting off Communications was my job. So I know what I’m talking about. When I asked about food, supplies & rescues, I was nearly lynched & beheaded by FEMA & Red Cross. In 2 years not one word was spoken about rescues, supplies or helping anyone. Only blocking off roads by law enforcement & troops, cutting off phones, blocking all frequencies, corralling everyone inside the metro area into convention centers & arenas held by troops without food, water, medicines or necessities. Just like Katrina. You have less than 1 hour to escape before blockades are in place. Take smaller side roads out. Familiarize yourself with back roads out of the area. Do not count on cell phones. They will not work. Take your medicines with you. If you remember Katrina, FEMA & Red Cross setup 100 miles from the storm area & said victims had to go to them for help. Victims who were held in convention centers by troops without food, medicine, shoes, transportation or any basic necessities. If you find yourself in such a situation, remember you outnumber the troops. Survey the troop situation & patterns of behavior. Identify leaders. Organize & swarm & disarm them. But remember, they consider troops to be expendable as they do victims. Take their uniforms & humanely immobilize them with plastic wraps they carry. Use their vehicles & uniforms to get out as fast as possible to avoid airstrikes. FEMA will tell troops & public that the victims held are contaminated with disease, biohazards, radiological or chemical hazards to justify total destruction of area & blame the victims. So there is no time to delay. Also remember every day without food or water you will become too sick & too weak to fight. So there is no time to waste. If you become trapped inside blockade areas go to back roads leading out toward rural areas. Low traffic & try these suggestions. Wear Military, law enforcement uniforms, first responder apparel, FEMA jackets & ID’s & possibly hospital nursing uniforms & firefighter gear may help you to escape the metro quarantine blockade. Go to Army navy stores or uniform stores & keep the outfits handy in case of extreme emergency only. Use it only when your life depends on it. I try to offer suggestions for situations our readers may encounter in the future. Once these situations occur, it is too late to ask questions. Many of these suggestions are for worst case scenarios like Katrina. If the borders into Mexico are closed or flooding occurs it maybe necessary to spend a few weeks in high mountains like the Rockies or Sierras until you can reach borders. Once the seas have settled, a boat is an alternate option to reaching central America. Use a short wave radio to listen for info. My radio runs by AC, battery, Solar or manual crank. Have US road map books handy. Your Tom Toms will not work. Glad to see that you are concerned about food. It is so important and yet most of us take it for granted that it is safe. Although I am still carefull how, what and when I eat it is now becoming greatly irrelevent. After I turned about 80, there were many things that became irrelevent. I now live on the edge of the jungle, REAL JUNGLE, and enjoy eating mostly our own fruits and vegetables. Living here is not paradise, I just killed two Cobra snakes yesterday, chicken love it; everything is soooo hard to get. Besides, it’s so damn hot and humid. Corruption is insane. Probably because it’s not hidden. When it rains, mud is everywhere. Everything is imported from China and everything breaks after a very short period of use. On the bright side, I have a very devoted care-giver, the air is clean, the sea non polluted. Lately we have plenty of rain and everything is very lush. I have no neighbors, that is the true freedom in any banana republic. Sorry if my sentences are a little chaotic, I am using Ipad because my real computer is broken. I don’t like Ipad because the dexterity of my hands and fingers is no longer there, plus the screen is so small. I can identify with the jungle. I lived in the Panama Canal Zone for 2 years when I was a teenager. If you didn’t know… the square root of number 44 is 6,63. That is very close to the infamous number 666. That eruption will be triggered by a man made machine: it’s name is CERN. Notice that it’s a french name. Centre Europeen de Recherche Nucleaire. There is a reason why they chose that name. It contains 4 letters and the sum of equivalent numbers is 40. However I will stop here because this is too long to explain on this blogg. Will get back to this later. I will add this: the Hadron Collider technology will be eventually used in about 35 years to exterminate the rest of humanity. Yellowstone is definitely a volcanic cauldera. So is the Mammoth Lakes region. There is also new activity in the New Madrid fault region. These are all factual geological timebombs which are all overdue for major events. But I’m not into numerology. Only Scientific verifiable facts. One thing I remember about Alzheimers were the high levels of Aluminum found in the victims back in the 1970’s. I have always avoided aluminum cookware, aluminum cans, aluminum antiperspirant, pickles with potash, red dyes with aluminum (lipstick), etc. Always read the label on anything you ingest or put on your body & Consider the container as well. Do not drink or cook in metal containers or Teflon. Use enamel or glass. Also, if you look at the bottle of any injection or vaccine you receive, you will see they all contain mercury or nickel, etc as preservatives. Another reason not to get these shots. There are some compounding pharmacy alternatives available. Parents of autistic children feel these mercury & other additives are responsible for their child’s autism & the children did not demonstrate those symptoms until they received the battery of infant vaccinations. I would not recommend avoiding vaccinations of infants but I would suggest waiting until they are a couple years old, space out the vaccines & check for vaccine alternatives without mercury, nickel, aluminum or some other toxin additives. Also, the only safe pet food is the solid gold Hundenflocken or katzenflocken or Van Patten’s pet foods. These are the only foods which are not processed by Menu foods in Canada which was responsible for the deaths of thousands of pets just a few years ago. I spoke with the Director of research at Cornell & a regional FDA inspector who received thousands of reports of pet deaths just in his region alone who also told me the meat is so unsafe that he became a vegetarian & his cat was one as well because the pet food was not safe either. I spoke with him for over 2 hours. The things he told me about the USDA and the beef processing plants using downer cows & cross contamination of poultry would give you nightmares. There are no positive tests for Mad cow because the USDA which was run by the owner of the biggest meat plants in TX wont allow any beef testing. No tests equal no positive results. They even sued a meat plant in Kansas who wanted to do his own mad cow tests so he could sell beef to Japan. The USDA claimed they Controlled all rights to the tests & he could not test without their permission. The USDA lost. I read this on CNN on the internet around Apr 2008. I’m not positive of the date. Cornell told me what they found in their own pets which had died. It was a lot more than what the govt & Menu foods claimed. They even found human cancer drugs & internal lesions which were not caused by Melamine. China said Menu foods ordered the Melamine which was shipped separately in a pink clearly marked bag. They showed the bag. They said menu foods added it to their own pet foods. Not china. Cornell was threatened with loss of gov’t grants if they continued to share their findings. I spoke with the person in charge. I lost 7 cats & one dog that week. When the public started buying Van Pattens food because his pet food didn’t go through menu foods like every major pet food brand in the us, someone contaminated the pork he was using to scare off his customers. The FDA inspector also told me when I lost three cats back around 2002 which all died within 2 weeks it was from the aflotoxin in the corn in Aims. I never feed my pets corn products now. There is no limit to how far they will go to cover up these crimes. And the public believes their answers & forget all about these events which continue to recur. I never forget & always do my own research for the facts. All of this info comes from reliable sources & can be found online. Any details I share on anyone is always based on info I obtained from reliable sources & should be accessible or verifiable. But be aware that gov’t & corporate entities will try to flood the internet with false info & paid skeptic attacks by hirelings to attack this info to protect their practices. Don’t listen to any skeptic which attacks & bullies people on blogs or high profile sites. This includes the altered wording on Wikipedia & the falsified info links they create for reference. Especially avoid those who are rude & shout down others. They go to great lengths to intimidate anyone who posts detrimental info about their products or practices; whether gov’t or corporate. I don’t allow them on here. Everyone should always do their own research on these issues. Well, it’s refreshing to read your view on the man made flue and other man made poisons. I never took those flue shots but my ex did with mixed results. However she is now having Alzeimer and I am unable to communicate with her. That may be the consequence of her life long swallowing the prescription drugs like candies. Here is a different subject that you mention in your blog, Denver! There is a 666 hidden in that name. Not as safe as you think, in my opinion. That place (the airport) is built with a purpose, it’s true purpose is not only to house or to relocate the White House officials but to become the death trap for millions of people. I would need more space for writing to explain this. I can say that this with a high degree of confidence: YELLOWSTONE WILL ERUPT…!!! This website (created by the defense industry) shows the population forecast for the year 2025. As you can see, USA loses about 80% of its population. However, notice how the rest of western world will be decimated as well. It is also evident that some figures simply don’t make sense, especially those for the middle-east and Africa in general. I believe that its simply a diversion. Notice also what happens to the PPP of US and all western countries in general. Figures on the far right. As I mentioned earlier, send me an email in December. Hopefully I’ll be still alive and I’ll let you know what expect next year… next year is crucial. Interesting! However, if the axis takes a final shift or some other global calamity occurs (asteroid, biological disaster, etc) the figures will be a lot lower than this. There is also the potential for deliberate manmade catastrophes such as designer flu viruses created in the FT Detrick bioweapons lab which they release in China each year. Doesn’t it seem strange that all the flu’s originate in China every year? Isn’t it beyond chance that we always know exactly which flu virus to create a vaccine for over a year in advance? It requires a full year to produce flu vaccines, yet they always know which flu vaccine to produce… a full year before it occurs. How could they know which one unless they produced the flu strain & purposely seeded it at some unsuspecting Chinese market or have insider biowarfare knowledge. Donald Rumsfeld was the CEO for the pharmaceutical company which makes all the flu vaccines as well as aspartame. The chances of a different flu strain always developing in China every year, occurring naturally is zilch as are the chances of accurately guessing which flu vaccine (12 months in advance) to produce every year. Why always China? Why not Europe or Russia? It’s because we want Chino to be the scape goat to use fear to control our purchasing of products to keep our thumb on China’s finances. If we want to reduce China’s finances & exert control our gov’t uses fear of a global pandemic or tainted pet food or other tainted product which we planted to scare people from purchasing or traveling to show China just how fast we can dump their economy with manmade viruses or tainted products. These are clearly manmade bio disasters. Also used to scare people into getting these shots which actually cause the flu in those I know who get them. My mother insisted on getting a yearly flu shot & always ended up sick in bed 3-6 weeks with the flu from the shot every year. I have never had a flu shot & never had the flu. These designer flu’s, as well as the vaccines could also be created to cause cancers, genetic changes, damage immune systems, etc. So when you read the Georgia Guidestone population prediction, it isn’t just natural disasters which could reduce our population but deliberate manmade bioweapons, food toxins, GMO products, etc which could achieve this “New World Order” population reduction goal. Run an internet news search on global shortages for 2020. Especially global water shortages. This could be tied to water shortages caused by contamination from seawater from axis shift level tsunamis or rising seas. We each need to learn how to desalinate water or capture & store rain water. It is also quite easy to break down water to produce hydrogen & oxygen as fuel sources. If these are manmade global disasters then those forecast dates would be tied to their biohazard activities. I doubt they would have accurate forecast dates for the final axis shift. Has anyone noticed how many people are dying in their 50’s lately? Nearly everyone I knew all died before the age of 58. Out of 200 people, only 3 survived past 58. This has been occurring during the past 10-15 years. Quite curious. No clear cause of death on any of them. I can’t say for certain but there could be a common cause. Also, read up on Monsanto and their Roundup ready GMO products (Corn & Soy). Also, the ethnic groups which have the highest diabetes levels in their population are the ones who consume the Most corn products. The soy has been found in breast cancers. Soy is high in estrogen. Especially bad for men. Read about their Roundup Ready Soy which is over 85% of soy in the US & Canada. But banned by most other countries. Soy is in nearly every product as is corn syrup. Both RR Monsanto products. Roundup is a grass killer herbicide which is in these RR foods. Monsanto owns Ortho who makes Roundup. Read up on these issues. Don’t take my word for it. The date and what will happen on that date are all encrypted in this video. Judging by the high level of sophistication of the video, it’s marvellously well coded, I have no doubt that it’s the real thing. There is so much information inside of it, that it’s simply mind boggling. It took me several months to decode most of it. Here, I’ll give you the very FIRST DATE: 29/11/2015. That is a Sunday. The Thanksgiving Sunday. Be in the boonies on that particular date if you want to live. Make sure you have food, water and electricity for at least 2 to 3 weeks. Take this the way you want and then, if you are still alive, give me a sign of life through email. By the way, I just turned 91 a few days ago. Body is falling appart but the mind is stil there. I am not even sure if I’ll be alive in December. I do agree with you about the planet-X, there is no planet-X. It’all man made! That includes the financial Armageddon as well. It took me a very long time to realize this. However, if you live in US you only have 20% chances to survive the coming calamities. THAT IS VERY LOW! Even if you do, you’ll be living in a banana republic when all of this is finished. There are some very powerful machines out there that will be used for this purpose. Only the very open minded preppers or the extremely lucky ones will survive. Those that know the exact dates and places of calamities. Yes, the dates and locations are set in stone. There are several dates and several locations. Failure to identify those will be fatal. I think 20% is too generous. I’d say more like 5% or less will survive. Mostly due to burying their heads in the sand or believing gov’t propaganda which keeps the wool pulled over their eyes. They wont know where to go or what to do because they wasted their survival opportunities bashing those experts who spoke out & tried to warn them. I have no sympathy for those who wasted their time & energy berating those who made an effort to prepare for calamities. We should prepare whether it be for tornadoes, hurricanes, floods, or some global catastrophe. It is better to have emergency supplies whether or not an emergency ever occurs. The only dates I’m aware of are 2020 & 2026. However, as I am writing this reply, I’m watching the clouds moving backward across the sky in the opposite direction. Initiated by a counterclockwise motion which has become the norm since the axis change. I have moved out of Dodge 5 years ago. The today’s situation was visible or rather HIGHLY PREDICTABLE as of middle of 2009 and those who saw it moved out in 2010/11. Not many were that foresighted though. The coming events are do cleverly camouflaged in plain sight, that unless you have a very special background you could not possibly decipher them. I was trully fortunate to be in situation where this kind of move was ideal time wise. As of this writing, things are getting pretty ugly all over the world. Those who can still see, better move out, and far away. Relocate as close to the Equator as possible. High mountain plateau with a big underground water reservoir would be ideal. Bush familly have decided that Paraguay will offer them the best protection against what is coming. Their property is far away from populated areas, high on a plateau, sits right above a huge underground water reservoir. I betcha they know someting. You will see similar suggestions from me on some of my older posts & comments recommending Central America on mountains which are over 300 ft above sea level with a fresh water supply above the 300 ft level which wont be contaminated by tidal waves such as an artesian well or glacial melt stream or other protected water source as the ideal survival location after the shift but not too close to any active volcanoes or coastlines. Fresh water which wont be contaminated by tsunamis or rising seas will be a critical issue. Why do you think our gov’t chose Denver to build their huge underground luxury shelter & underground mag lev trains connecting every major city & airforce base in the country? Denver is the mile high city (far above rising seas or tidal waves & far from coastlines) & the surrounding Rocky Mountains are rich with fresh water & granite for impact protection. If you look at the geological history of the US, you can see how the midwest & west like NV, UT, etc were once covered in seawater which took thousands of years to evaporate leaving salt deposits & salt lakes in the last areas to evaporate. I don’t think this was all caused by rising sea levels. One scientist said he found evidence that the earth tilted onto its side & back 11 times in the past. Each time the planet has a significant shift in its axis, it creates tsunamis like the one in Indonesia in Dec 2004. The larger the shift, the larger the tsunami. I believe the US was inundated with a giant tsunami many eons ago which covered our midsection & West with sea water hundreds of feet deep which took thousands of years to evaporate. Like a giant landlocked trapped puddle created by a monstrous tidal wave which surged over our continent. If you remember, the 2004 tsunami was over five thousand miles wide from SE Asia to Africa. Multiply that global shift by a factor of 10 if our planet should decide to take a sudden nose dive & shift the remaining distance onto its side. It would look a lot like that movie “2012”. Maybe they were trying to tell us something like they were doing with those ghastly murals at the Denver airport. Most of the information is out in the open but few are smart enough to comprehend it. Most would rather bury their heads in the sand & deny it. It is their right to do so. However, they are also the ones who don’t prepare for calamities & viciously berate anyone who does prepare… and once the disaster occurs, they will turn into vicious mobs who will attack & kill those who prepared shelters & supplies & steal what they have. Remember that Twilight Zone episode about “the Shelter” & how they ridiculed the neighbor who built a shelter then turned into a mob breaking down his shelter door when a disaster occurred? This is exactly how people will behave. Even your best friends & relatives will turn on you if you have something they want. So if you have set up shelters, supplies or escape routes, I recommend including huge caseloads of ammunition & weapons to defend against these mobs. You will also have to deal with martial law troops. From what I have seen, the indications are the gov’t is expecting a global calamity to occur between 2020 and 2026. However, since we had such dramatic changes between 2013 and 2014 plus a reversal between 2014 and 2015, I am quite curious to see what will occur in 2016. This could be evidence of a final death wobble like you would see in a spinning top as it loses momentum just before it falls over. This whole issue is very confusing. I have spent the last five years debunking it and I am still on it today, although I am now spending much less time. Getting too old to worry about it. What I see coming is a whopping 16.2 degrees shift as of next year. That will be 23.4 + 16.2 degrees for a total of 39.6. That will eventually have the same consequences as melting of poles (water and food shortages), but instead will freeze them. This information is public but hidden in plain sight. If interested and considering the vastness of the subject, I will suggest a private exchange rather than a blogg. I have done an extensive study on what’s going on presently. Five years of research permits me to conclude at least this among others. We will get a massive tilt change next year 2016. we are talking 16,6 degrees. That’s 23,4 + 16,2, for a total of close to 40 degrees. As a consequence, we will go to 360 days per year or 30 days months. What is coming our way is simply mind boggling, impossible to explain here. My advice: keep (run away is a better word) away from US. Forgot to tick the notify box sorry… but doing so now.. God bless you all. In Kwazulu Natal where I live, the sun is not in the middle of the sky at midday (noon), but hangs lower towards north/north east and at sunset its arc seems shallower than it would have been (almost as if it took a shortcut from eastern to western horizon). However, a few weeks aways from our winter solstice now, with the sun setting too far north here and you guys in the US also saying it sets too far north, surely in the southern sky, it should then be setting too far south? — as surely the southern is a reverse or opposite of the northern hemisphere? Or am I way off beat? I know so little. Or am I mixing up summers and winters? My next question: When Sitchen and Velikovsky before him, stated that the Earth has had many prior pole shifts they based on very intense research and even Edgar Cayce and many other greatly respected psychics mention cataclysms which periodically visit and subject our planet to, why are people shying away from the very much debunked Nibiru/Planet X/Wormwood/Tyche/ or whatever name its referred too? I have since 2011 been following ZetaTalk and find their FREE information on the pole shift pretty credible (again from my limited perspective), as since childhood I have had no doubt that off planet beings are a reality and that what we do in our solar system and specifically on our planet, can negatively affect their neighbourhood and this makes sense to me. Anyway, I find it all fascinating and would appreciate thoughts on it all! If things get too rough your side, maybe SA is not such a bad spot to be, as it seems our geographical location is a bit more safe, due to the solid African plate, but then we have also been having a few baby earthquakes here and there, especially near Johannesburg and in the Orange Free State, which shudders through to Umhlanga Rocks in Kwazulu Natal. Although all these changes are fascinating, they are very, very scary. What is the “Normal” …pre-2000 position of a Sunset for North America in terms of Compass position, or degrees. I have a compass and I show anywhere from 300 to 310 degrees here in Winston-Salem, NC. Also, I have lived in my house since 1984 and notice the way Sunset looks from my window. Before the year 2000, when the sun was normal… the sun position changes every day throughout the year as the earth orbits the sun while tilted on its axis. It travels between the 2 tropic lines (Cancer & Capricorn). On June 21st, the longest day of the year and the summer solstice, the sun is at its farthest north point which should be the tropic of cancer which runs through mid Mexico. Your latitude also affects the angle of the sunrise and sunset based on how far north you are on June 21st… but one thing is for certain… the sun should never be rising or setting to the north of any home in the US or anyone who lives north of the Tropic of Cancer. Also keep in mind that magnetic north on the compass is not the same as true north. The two are getting closer but not exact. I find it is easier for people to visualize it using Google earth or a clock face. You can use Google earth to determine true north for your location and to visualize the tropic of cancer location by activating the gridlines on Google earth. You can also use the longitude lines to lay out the time of day to coincide with sunrise and sunset. The sun travels in an arc so it is best measured at sunrise and sunset when in contact with the horizon. Using the gridlines on Google earth, you can draw lines to the tropic of cancer to coincide with the time of sunrise and sunset scheduled for June 21st (Daylight standard time) to give you an approximate angle of orientation for where the sun should be rising and setting from your location on that date and time. If you were looking at a clock face instead of a compass with 12 pointing north… the sun when it was normal back in the 20th century (15 years ago) would have been rising at about 4 on the clock face and setting about 8 on the clock face on June 21st. That is a generalization… but enough to give you a basic idea. Since all of the axis shifting occurred, we are seeing the sun rise between 1 and 2 on the clock face and set between 10 and 11 on the clock face. Instead of the sun being south of us… it is now north of us. 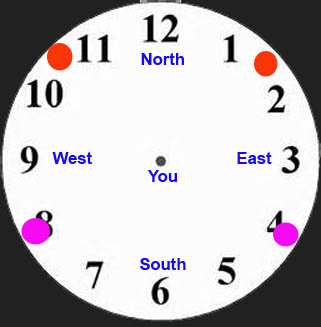 On the clock face, we would be located at the center. Due east would be 3 and due west would be 9. If you look at my other posts, I attached clock face images to show where the sun should be and where it was before the year 2000… as well as clock face images to show where the sun currently is… and it has continued to move farther north. We had an additional significant shift between 2013 and 2014 which is why we have had such increased severe winter weather this past winter. I will be reposting the info again in a week or two so everyone can be ready to measure the sun on June 21st again this year. If you check the sun on June 21st every year, and use landmarks to line up the position of the sun, you can see when the axis changes. 2004 was the worst. There were other smaller shifts in 2005, 2010, 2011 usually coinciding with a tsunami and one in April of 2003 as well. I have been measuring annually since June 2006. I noticed it in 2005 when the sun began flooding into my north windows for the first time ever. However, I was quite surprised when I saw how much more the planet had shifted again between 2013 and 2014. We don’t always hear about all Tsunami’s unless the destruction makes it to the news. The one in 2003 was caught on a satellite image but was never reported and is not listed in the tsunami database. There is a lot of underreporting of the weather and a lockdown of info by the NWS to dissuade people from noticing just how bad the weather problems have been getting. That’s when the public starts looking for reasons why the global weather, volcanoes, quakes and other problems have begun to plague the planet on massive scales. In the past year, the people who have started following this issue has increased from a few thousand to over 60,000… increasing each day as they see record blizzards, droughts, floods, bizarre jet stream behavior, etc. It is really getting quite obvious to everyone that we have serious problems. Take a look at this clock face. The pink dots are pre-2000 sunrise and sunset positions. The red dots are the current sunrise and sunset positions as of June 21st 2014. I have noticed the change in sunset and sunrise. Being part of the over-50 crowd and growing up in southern AZ I know the sun never rose or set to the north. I am wondering if the crazy polar vortex in the midwest and the east and the drought in California are somehow related to the axis shift. I miss the rain and fog, and the frost. It was so warm here in CA this winter, we haven’t really had much frost, I’m pondering if I should start the garden early this year. The weather is definitely tied to the axis change. It makes us 2000 miles farther south in the summer and 2000 miles farther north in the winter. The melting of the polar ice has also increased humidity and precipitation… hence blizzards and flooding. However, I would not start a garden until at least mid April.. at least in the midwest… IMO. I no longer live in CA so I haven’t been keeping track of the weather patterns. You might want to take a look at the last 3 years… and 2014 in particular. I am clearly not a garden expert and I could not speak for weather except in Texas I would not trust the weather here until the 3rd week of April. I still remember about 2 ft of snow occurring in mid April 2004. Last Spring, 2014, we had bizarre alternating extreme cold and hot weather in April. It was going back and forth every 3 days between extreme cold and heat. I wrote a post about the bizarre weather at the time. I don’t expect any improvements this year. This will be the most severe winter on record. I had stated this last summer after I saw we had shifted even further when we did our June measurements which meant we were going to be even farther north during the winter than we had been after the major shift in Dec 2004. Basically moving us from 1200 miles farther north in the winter to about 2000 miles farther north… and vice versa… farther south in the summer which is why we see the sun so far to the north during our summer. The distances are just a SWAG. I don’t have the technology to do precise measurements… I can only get approximations with manual measurements. But close enough for a general understanding of expectations and effects. Our local farmers do not plant until the last week of April… but they are growing grain produce and I realize there are many greens which require longer growing seasons and cooler weather. California is a completely different weather system. In the summer, your weather should be similar to what the Southern tip of Baja was before the 2004 shift. You may need to use some type of sun shielding in the summer like the nurseries do. The same protection you need for the increase in the sun on your skin. You can purchase shade covers by percentage of solar levels you wish to have. I’m not an expert on this issue… but the temperatures for us are now more in the tropical range which is actually cooler and wetter in TX and the AZ areas. Texas which was dry summer humidity, now has tropical humidity in the summer and last year we had rain all through summer and highs in the 90’s where we would normally have been above 110 and zero rain for July and August prior to the shift in 2004. Tropical heat is actually lower than our former desert conditions… with the increased humidity. It is actually an improvement in our summers to change into the tropical regions. I lived in the tropics for 2 years when I was younger, and am now seeing similar temperatures and humidity in TX since the 2004 shift. I don’t know if that is of any help but I would be careful of floods after mid April through at least July if you are in an area which is prone to these. But I don’t know about California. You may be seeing desertification from the changes in weather patterns, ocean currents and global shifts. Where we once saw the formation of vortex weather patterns in the tropics which formed into hurricanes as the weather systems spun off the coast of Africa… we are now seeing similar spinning weather masses occurring over the central US since 2004… especially in the spring months. The increase in tilt moved these spinning weather patterns north along with the sun as our planet shifted farther to the south in the summer. The spinning systems sit over the central US scooping up cold air from Canada and hot air from the gulf as they spin which causes the alternating hot and cold weather patterns we now see in mid March through mid May. While this is not over California, these spinning vortex systems sitting over the Midwest are clearly preventing the inflow of weather systems into California and redirecting the jet stream above or below these systems instead of crossing the central US as it once did. It is like a weather dome blocking your weather fronts from coming into California, thus keeping it dry. One of the other “unrelated” things I noticed when I lived in California in the 80’s was how it never rained during the week when all the commuter traffic was creating a wall of heated CO2 and smog between the ocean and mountain range… but the rains would move on land every weekend when this wall of smog dissipated. It was the same every week. No rain Mon-Fri and then rain on weekends. Just like clockwork. But this was BEFORE the shift. However, that wall of weekday smog would still be a factor in preventing the weather systems from bringing in rain during the weekdays. It can only be worse now with increased population and development. This is a similar reason why tornados typically veer around major cities at the outskirts. They usually damage small airports and mobile home parks because these are usually placed on the outer perimeters on the west side of town where the tornados occur. The only reason a tornado went through downtown Ft Worth in 2000 was because Ft Worth is nearly abandoned downtown. Most of the buildings were unoccupied and almost zero traffic in the downtown area… thus, no traffic creating heat bubbles and hot concrete which normally cause a tornado to veer at the outskirts. These traffic heat bubbles affect the weather a lot more than people realize as does the spinning vortices which have formed over the central US since 2004… mostly in April and May. You won’t hear about these from the weather service. They are not allowed to point out anything unusual… such as the tornado in California last week. They can only be dismissive about the unusual weather… unless they wish to lose their meteorology licenses. I saw one female on the Weather channel one Sunday a few years ago who started making comments about the unusual vortex systems over the central US. She was yanked off the air in mid shift and never seen again. Another meteorologist who saved Little Rock by contacting the local gov’t emergency services about a forming tornado when the national weather service REFUSED to declare a tornado warning… was severely punished and was threatened with his license for declaring a tornado WITHOUT their permission… even though he was right. ALL weather has to be cleared and controlled through NWS and NOAA. They control all meteorologists the same way MUFON controls the UFO investigations. The latter is also a gov’t front organization to control info as NWS and NOAA do for the weather. The same for any area of expertise. All controlled by gov’t agencies or working for Universities or DOD contractors who get their monies from the gov’t. If you don’t play ball… you don’t work in your profession. There are very few of us willing to speak out… and they have attack dogs to attack the integrity of those who speak out as well. But if you would like to see these spiral weather systems, there are about 100 loop satellite images of them on this link. http://divulgence.net/Satellite%20weather.html which compares how the weather systems over the US were prior to the Dec 2004 shift and after the shift… so everyone can see how it was 3 years before and 3 years after. I didn’t create any after 2007 due to illness. Although it might interest you to know that lightning data is classified. I couldn’t believe it. I asked for imagery and data on a specific ion storm I had seen and was told by both the university and by NOAA that all lightning data is classified. WHY? I do know they concealed the two ion storms I witnessed and at least one other someone had witnessed off the coast of FL. Lightning protection is one of my fields of expertise and I know an ion storm when I see one. Very rare. But it occurred in June 2007 at the very same time the space station experienced failure of all 6 redundant computer systems and the shuttle STS-117 just happened to be there that week with a full supply of replacement circuit boards for their computers… meaning they saw this disturbance coming from the sun and knew in advance they would have to rescue the crew. They had to put the crew on the shuttle for a few days until the systems were repaired… fortunately, they were able to fix the computers. This was clearly an Ion storm I saw that very same week and the same charged particles which caused the storm also caused the ISS computer system failures. There was no doubt in the connection but they lied about it. I wanted videos of that storm. There were 2 in the same week and my video camera batteries were dead… and was told all lightning was classified… not to mention denying it was an ion storm. If you ever see one, you would remember it. They are quite rare. It is a lot of blinding flashes in the sky without any thunder and you don’t see lightning bolts either… although not impossible to have them as well. It makes an electrical arcing sound and some popping sounds with the flashes… but no thunder. The flashes are blinding and rapid. Like a strobe light. It is quite powerful and unnerving. Like nothing most people have ever seen. I realize this has no bearing on your questions but I thought I would mention it since it was something unusual and weather related and tied to information cover up as well. The axis shift also alters the jet stream and the vortex patterns which are likely redirecting the normal weather patterns away from California. When I lived in northern California, we had wet season in the winter and dry season in the summer. So everything was nice and green in the winter but dead and brown in the summer. The shifting of our planet also affects the currents and temperatures of our oceans which also changes weather systems. So that also impacts the weather in addition to the shift of our axis. I heard one comment that the new conditions would create deserts in areas which were previously fertile and tropics where deserts used to be. Our main worry will be when the planet decides to shift the rest of the way onto its side. That will make these changes we are currently seeing… like a drop in the bucket. In June, we will see if the axis has slipped any father. Last June 2014 was the first significant shift I have measured since the big shift in Dec 2004. Ironically, only those of us over 50 have been around long enough to notice that the sun is not where it is supposed to be. Even so, I did not catch on immediately until the neighbors started complaining about the sunlight glaring in their north windows and realized I was also having issues with blinding sunlight coming through my north windows for the first time ever. When I had replaced the windows on the north side, I nearly omitted the polarized glazing because I knew the sun never shined through north windows. Fortunately, I included the glazing to make the windows uniform in appearance… never realizing that they would be needed just a year later. Of course, everyone came to me about the problem with the sun and that’s when I started researching and measuring and keeping track of the changes… mostly for my neighbors but then there were a lot of other people who started realizing the sun was not where it was supposed to be. Most housewives over 50 automatically know not to place window plants on northern windows because they would never get the sunlight. So those with window plants were the first who realized something had changed. In my case, I was getting blinding sunlight through my north windows in my eyes at sunset and filling the room at sunrise creating new problems with things which can be damaged by direct sunlight… and the need to install shades where none had ever been needed. Those under 50 have a different problem. They don’t teach these kids basic science in school anymore and they’ve all been programmed by rhetoric and propaganda documentaries to disbelieve everything except what the gov’t tells them. They keep them occupied with toys, technology and chemical entertainment so they are oblivious to what is going on around them. They don’t have the wherefore all to research these issues because they don’t notice the world outside of their sphere beyond their wireless bubble & self indulgence. Not to say there are not those rare exceptions who can see outside the box and beyond the dogma the public is being fed… but unfortunately, the ones who notice the most are the 50-70 crowd. Mostly because our era was involved in politics and environmental issues and aware of the consequences of damages to the planet. Now they fill the TV with shows promoting tree cutting (Ax men) and low brow entertainment and revisionist history and revisionist science to placate the public that everything is perfectly normal. Can’t have any disruption of the economy. The power mongers might lose their elite status by a half point. They already have their reserved seats in the shelters under Denver. The rest of the world is expendable. I can’t help but think of the eloi’s and morlocks when it comes to their shelter under Denver and massive tunnel systems connecting all the USAF bases and key facilities, etc. I am noticing tonight how wildly far north the sun is setting here on vancouver island… and similarly how far south it is rising. Be sure to use true north to line up due east & west. Compass north is offset. Google earth can help line up true north for any location. If the sun is to the north in Vancouver, we are in far worse trouble than I estimated. We need more verifications of sunrise & sunset positions in the northern states, Canada, Europe, etc. We need to find out what latitude the sun is rising & setting due east & west on June 21st. I have been waiting for someone from the southern hemisphere to verify what we we seeing in the north. The melting of polar ice which caused the imbalance of the weight of the land ice which anchored the angle of our tilt subsequently allowed the axis to slip in the first place and further increased the rate of melting as the axis began to slip more. The initial massive melting created excess humidity levels & excess precipitation. Hence flooding & blizzards were the results. Just check the yearly FEMA reports since 2004. I have a friend who has lived in Alaska over 45 years. He used to send photos of him on top of his roof removing 15-20 feet of snow above his home. But the warming which preceded the first major axis shift in 2004, dramatically changed the polar climate. This is the direct result of the warming everyone was programmed to believe was a joke. Early in the 2000’s, the December temperatures in Alaska were at 45 degrees F and my friend rarely saw much snow or use for his snow blower. This is significant because he lives in Yakutat near several rapidly melting glaciers. Siberia has also seen a loss of most of its glaciers & snow cover. After the axis began to shift in 2004, the summers became warmer & winters colder. But the melt rate is far faster than the freeze rate. Nothing less than eons of a new ice age would be needed to replace the anchor weight of the south pole ice to restore the axis to its optimum angle. The global warming which the public was programmed to disbelieve as a joke; set the initial melting in motion but now the axis has shifted, means it is now too late for us to fix it. We do not have the capability of restoring millennia of ice layers to the Antarctic continent. When we had the opportunity to stop the warming, corporate greed could not be impaired or inhibited by reducing their pollutions but now that the axis has shifted, they are in a panic to keep this damage hidden from the people for fear of retribution upon their products & profits. Their hand picked politicians who fill every aspect of our government & governments throughout the world are in the same panic mode & will go to any lengths to keep this quiet. They fear the outrage & anger of the public if the people should learn of this damage to the planet & who was responsible. However, we can rest assured that they will save their own miserable hides at our expense when the worst occurs. The public won’t bother to examine their own culpability in this travesty. Our South Pole anchor ice weight which keeps our planet in balance has been losing massive ice shelves & melting land ice. The north pole is in worse shape but does not contain much land ice. The more land ice melts, the more our axis will slip as the weight of our equator pulls us onto our side. When we reach the tipping point (presumably around a 50 degree tilt angle), the axis will flop the earth onto its side. However, it’s difficult to be precise about a planetary body in space under Solar & lunar gravitational forces & orbits. It would take a better astrophysicist to work out the required mathematics. Although it will continue to rotate counterclockwise, it will be south to north. The poles will be horizontal but it will depend which direction the tip occurs to know whether the poles will be east & west or one pole facing the sun & the other on the dark side. There are quite a number of positional possibilities & that will continue to vary as the earth orbits the sun in a relative position. One such possibility would have one pole facing the sun 24 hours a day for 3 months & the other dark for 3 months until the orbit moves to the opposite solar orbit where the poles would then be in inverse positions. During the between months of fall & spring, the poles would be east & west. This is best envisioned using a home globe. The change on our weather will be dramatic. That final axis slip will also cause the mother of all Tsunamis & flooding. The ice on Greenland alone will increase sea levels by 29ft. All of the world’s ice melting would increase sea levels by 297 ft. Think about that if you live less than 300 ft above sea level. What misleads people are the increasingly colder winters & hotter summers we are currently experiencing because the angle of tilt is more extreme during both seasons. Hence, we are tilted farther south in the summer & father north in the winter (in the northern hemisphere & inverse for the southern) as we orbit the sun. However, the public wrongly assumes the colder winters with heavy precipitation implies there is no problem because their mindsets are limited to global warming catch phrases. They don’t believe in axis shifts because they’ve been programmed not to believe their own eyes. If they don’t hear it on the news or documentaries it doesn’t exist. Since there have been no disaster movie style cataclysms, they accept the sun setting in the wrong position as a normal occurrence. They don’t want to think about the sun setting north of the US states or South of Australian communities when it should never be farther north or south of the Tropics of Cancer & Capricorn which run thru central Mexico in the Northern Hemisphere & Brazil in the South. It is disconcerting how many people in the US think it is perfectly normal to see the sunrise & sunset to the north during the summer months. It would be inverse for those in the southern hemisphere. I found it quite noticeable when the sunsets & sunrises began to shine through my windows which face directly true north for the first time during June. I carefully selected my window glass tint & window shades based on the fact that no sunlight ever entered the northern windows until June 2005 when that changed. My neighbors noticed it even before I did. That’s when I began in-depth research of the sun, weather patterns, earthquake & Volcanic activity levels & frequency, solar activity, tsunamis and other factors. The most notable change in the axis began after the huge Dec 2004 tsunami killed over a quarter million people in southern Asia, Java & more. Tsunami’s are not caused by earthquakes (contrary to what we’ve been told), although they usually occur in conjunction with a quake. Tsunamis are caused by an abnormal movement of the earth or shift in the earths crust. Very few earthquakes are associated with movement of the earth or shifts in the crust position. This is why not all earthquakes produce tsunamis, even when the precise location & intensity of the quakes are nearly identical to a previous quake when a sizable tsunami occurred such as Japan in Mar 2011. It is similar to walking across the room with a bowl of water & the motion causes the water to slop over the sides of the bowl. The rougher or more active the motions; the more water is slopped out of the bowl. These movements or shifts of the earth or its crust usually produce both an earth tremor with a tsunami. But the tremor is not the cause of the Tsunami; the motion of the earth is. To envision the effects of a plain tremor place the bowl of water on a vibrating pager or phone. It will cause the water to agitate but does not cause the water to slop out of the bowl. It requires motion & inertia to slop the water out of the bowl or to create a tsunami. Granted, some quakes produce a rocking motion & some are sharp jerks & even a loud bang. I’ve been in all kinds of Quakes formerly living in California for 13 years; including the 89 San Francisco bay area quake which certainly slopped the water out of the hot tub & continued for several minutes; but the forces generated in water would have been less than 3 ft wave action even if it was under the ocean in a prime location. This is why there are so many false tsunami alerts which cause some apathy among the residents. There are thousands of intense earthquakes which never caused Tsunamis. For example, Japan has had hundreds of offshore quakes at the very same location & very near the same intensity as the March 2011 quake. Hundreds within days of that huge tsunami at the same location & nearly identical intensity without creating another tsunami except for minor wave action. But there were other historic Tsunamis there over the centuries due to the crust movements from the ring of fire; which is why they attempted to build sea walls & install warning systems. But those false alerts made people apathetic until significant shifting of the earth’s crust began in 2004. We are now seeing an increasing pattern of super Tsunami’s, super Quakes, super storms & super volcano activity worldwide. The sudden intensity of the earth axis slippage motion acts like a sudden jerk or sudden stop while carrying the bowl of water. It is the inertia. The same happens to your body in a car if it comes to a sudden stop and you are hurled forward. The current collision theory of earth’s moon formation is absurd since it would produce much rock debris & possibly rings if the planet was not in a molten state at the time. We have supposedly top level scientists showing animations of a collision with the already cooled planet earth, creating a perfectly spherical Moon & earth (post impact) without leaving any space debris. When Liquid is in the zero gravity of space, it forms spheres. This gives was a simple way to determine whether an object in space was liquid or dry when it formed. One of these documentary scientists is a well-known & respected theoretical physicist whom I was astonished to see supporting some poor excuse for a scientist in this half baked theory. Likely a political support of a follow professor tenured at the same institution. Either our quality of scientists are sadly lacking or some are selling out their credibility for grant money & accolades. Having been an engineer & scientist myself, I have to say the talent levels have gotten very thin since the retirement of our top of the line science, aerospace & engineering experts who nearly all retired by the late 1990’s leaving a bevy of younger replacements without experience, ethics or true dedication with the delusion that all prior discoveries & methodologies by former laureates should be totally disregarded and discarded. Hence, those who fail to learn from the past are doomed to repeat those errors. The new breed of scientists have created a world of the blind leading the blind. Half baked scientists & engineers who attack any competition, crave publicity, and sell out for money & unearned titles to cover up their lack of intellectual capacity while advancing on the backs & achievements of others; taking dangerous shortcuts, disregarding all tenets of safety & reason. Just some insight on why the current scientific community cannot be depended upon to provide reliable info or advice on anything. More & more fields of expertise are having similar problems finding quality, experience, ethics & dedication such as medical, law, politics, etc. I believe the axis shifts are being caused by the loss of ice over land areas at the poles. The weight of the land based ice affects planetary balance. Not the ice over water. The south pole acts as an anchor to maintain the earth’s balance. This makes the South Pole ice loss the most significant place on Earth where the balance & orientation can be affected. For instance, take a rubber ball & attach coins on the top and bottom and float it in a tub of water. If the coins or metal washers are heavy enough, the ball will assume a fixed position in the water. If you change those weights, especially at the bottom anchor point, or move or disburse the weight to different locations, the ball will shift position in the water. Keeping in mind there is very little land based ice at the Arctic. As the ice melts from the land, the weight disburses equally into the oceans & increases the sea levels. The melting is also decreasing the weight of the ice which has the earth locked into the axis angle. As the anchor weights diminish, it allows the earth to shift position. This is also what caused the GPS satellite problems between Dec 2005 – Apr 2006. The earth shifted. The satellites did not. So they had to write a software patch to realign the GPS to produce the expected readings & blamed the failure on a nonexistent historical solar flare. Then they tried their best to eliminate all solar images, data & records from NASA, SOHO, etc. which could reveal there was no flare on that date… however, they missed a few. You can find these records on divulgence.net. They waited for the international scientists conference in April 2006 to get the worldwide scientific community on board at the same time. The following week, NASA announced the historic solar flare they supposedly found in Dec 2005 which damaged the GPS & interrupted the cell phone networks. If it had been a genuine historic flare NASA would not have waited nearly 5 months to brag about it. It took nearly 5 months for them to remove the incriminating data, create false records & recalibrate the GPS network to correct the change in satellite positions. They went to all this trouble just to cover up a shift in the earth which affected the GPS network. They think the public is better off believing it was a solar flare rather than tell them the axis is shifting & open the can of worms regarding cause & blame. Fortunately, the weather satellites did catch the image of the earth when it shifted. There are also a few solar data records which NASA & SOHO failed to eliminate in their purge. All of the data together substantiates the cover up & the shifting axis. Those can also be found on divulgence.net. However, the scientific community will viciously attack anyone who suggests the axis has been shifting. In fact, the intensity & degree of their attacks should be a major indication of the determination to silence anyone who reveals any of the carefully concealed details. But they can’t hide the sun so their only recourse is to convince the public it is normal & any claim to the contrary must be silenced. They will accept what they are told. The public has been programmed to attack whenever the conspiracy label has been used. We destroy our own now anytime our puppet strings are pulled. We have to remember that nearly all astrophysicists, professional astronomers, geologists & scientists in these fields either work for the government or a government contractor or a university receiving government grants. This is true worldwide. Even those in other countries not working under their governments are usually in a country which is financially indebted to the US which uses their indebtedness to coerce them into compliance. This also includes retired scientists who rely on their pensions from the same sources. Anyone who dares to speak out is viciously attacked, credibility destroyed & soon unemployed. I’ve seen several whom have suffered this fate. So if you want to know why none of the world’s scientists are saying anything; this is why. Few dare to defy the science mafia. They have become a pack of dogs on the gov’ts leash who attack anyone who dares to spill the beans. It is the same gov’t paranoia as with Roswell or covering up the severity & hazards posed by the damaged nuke reactors such as in Japan. They fear public response toward their new nuclear plant constructions if we knew the full extent of the global dangers from the radioactivity spewing from those reactors. Profit & greed outweighs public safety. Thus, if the public knew the melting ice was causing our planet to shift, the public might become aggressive about air pollution & climate changes which would impact the industrial Complexes & corporations in their pocketbooks & their freedom to pollute the planet at will. A prime example is how they are extracting hydrogen fuel at great expense from oil when water is H2O and free. (2 parts hydrogen). With rising sea levels, there is plenty water for hydrogen fuel but that means the oil companies could no longer control the planet with oil & pollution. It is the same for several alternative free sources of clean energy. The greedy corporations who select & groom & control our politicians & government don’t want anything which costs them profits. So we have everyone watching their spoonfed news reports who think it is perfectly normal to have the sun rising & setting about 2000 miles farther north than it should (northern Hemisphere). But it wont stay that way. Since the equator is larger than a longitudinal circumference & has additional weight from land masses & mountain ranges, at some point, the anchor weight of the ice at the poles will melt enough & the axis will shift enough to reach a tipping point. Then the earth will suddenly end up laying on its side with the equator rotating north and South. (not upside down like some people think. There is not enough weight at the top to flip completely over upside down. We would be better off if it was possible. But the weight is at the equator & will pull us onto the side to disastrous changes in the weather, where it will remain until the south pole refreezes & restores the anchor weight.) If you ever wondered what calamity destroyed the ancient world structures, flooding, turning plush greenery into sand covered deserts and wiped out entire civilizations & species… just imagine what an event of this magnitude would do. According to one documentary scientist, this axis tip has happened 11 times in earths past. Imagine the weather & damage from such an ordeal & perhaps those trillions of dollars the gov’t is spending on underground shelter cities, tunnels & supplies at our expense to save their worthless hides… we can only hope the water will flood them out & the tunnels fracture so they’ll be in the same boat as the rest of us. Reminds me of the movie “When worlds Collide.” Don’t dismiss Jesse Ventura’s show about the underground city under the Denver airport. I know people who worked on some of these projects. The gov’t is also concerned about flooding water which is why they chose the mile high city. This is also why they are reluctant to spend money repairing coastal damages. Just because someone believes in a conspiracy theory, that doesn’t mean it is untrue or the person is unhinged. It means big brother is trying to shut them up. They use labels to harass, bully & discredit anyone who tries to alert the public to corruption & nefarious activities. The public has become so programmed like the ringing bell salivation response in dogs, that the public is now attacking anyone who tries to alert them to things they should know. The public should think about this the next time they roll their eyes at someone who is trying to share the truth. Philip Corso, Bob Lazar, Jesse Ventura, FDA, gov’t & tobacco whistleblowers… all attacked for their efforts to help the public. Attacked by the thankless masses they were trying to help. The only question is when the final axis shift will occur. I’ve heard gov’t estimates about the onset of major global sea level issues anticipated as early as 2020. They seem to be in a hurry in their constructions. Those small quakes in the midwest are currently being caused by the tunnel boring machines. These quakes are usually between 3.0 and 4.0 and the same depths. You can track the tunnels on google earth by the dates of the small quakes. Some are from fracting but those are different. The tunnels are currently being bored in OK & TX. There is a photo of one of the boring machines under one of the other commentaries. If all the politicians & corporate CEO’s start to head for Colorado, it’s probably time to worry.